Unfortunately, bathing can be stressful for some dogs, as some just tolerate it better than others. For those pups who are particularly skiddish, consider brewing some chamomile tea to calm your dog. Thirty minutes before you bathe, give your dog a cooled cup of chamomile tea with honey, followed by a dog treat that’s rich in carbohydrates, like our Antioxidant Health Bars. The carbohydrates will help deliver the calming tea straight to your dog’s brain. Better yet, you can both sit down with some tea and play soothing music, to set a calming tone for your upcoming grooming session. You can also give your dog tea during the grooming session. As we’ve already mentioned, just make sure the tea has cooled off (no hotter than room temperature). I recommend the use of a grooming apron with pockets that covers you from chest to mid-thighs, to protect your clothes. While you can always put your clothes in the laundry later, dog hair can be difficult to remove from a washing machine. A full apron not only protects your clothes, in the pockets you can keep treats, shampoo, conditioner and a brush. The treats you choose must smell appealing to your dog - like our Tasty Rewards Training Treats - and keeping them in your apron pockets will leave your hands free for grooming. If your dog is of a long-haired breed, brush with a fine-tooth comb prior to bathing, so you don’t have to contend with knots while shampooing, potentially making a bad problem worse. Whether you bathe your dog in the tub or the backyard, sit on a low stool to prevent stress or injury to your back and knees. If you’re outside, I advise that you use a six-foot leash. Tie it around your waist or hook it on your belt to free up your hands and prevent your dog from slipping away for a sudsy romp. If you’re using water from an outdoor hose, keep in mind that, while it might be warm outside, the water will feel cold to your dog, not always without substantial discomfort. If at all possible, use tepid water, either by running extension hoses from the sink in your house, or simply bathe your dog indoors in a tub. When you apply the shampoo, make small circles with a hairbrush with plastic nubs to distribute the shampoo evenly through the hair and onto the skin. This will also exfoliate the skin and allow the herbs in the shampoo to penetrate the skin. Leave the shampoo on for about three minutes, but don’t allow it to dry as this can irritate the skin. Our Revitalizing Shampoo suds well, rinses easily, and features rosemary to help increase blood flow, ultimately contributing to healthier skin and hair. Most animals really don’t enjoy having their heads washed, so I suggest that you simply wet the head using a wash cloth. That way, you’ll be sure to prevent shampoo from entering the eyes or ears, making the entire experience more enjoyable for your canine companion. I recommend towel drying your dog versus using a blowdryer, which can excessively dry or even burn skin, and frighten some dogs with the sound generated by this device. The best method for towel drying is by patting rather than using a circular motion, which can often lead to matting. In most cases, you’ll be able to see an immediate change in your dog’s appearance following a bath. You’ll know that you’re using a high quality shampoo when your dog has a shinier, fuller coat, less dander and no more “doggie smell”. With moisture-activated odor neutralizers, our Revitalizing Shampoo features antioxidants and organic extracts of rosemary and sage, nutritive herbs that penetrate into the hair shaft and promote coat health. Also included are kiwi and mango essences, selected because they too enhance the health of the skin, as well as leaving your dog’s coat smelling clean and fresh. 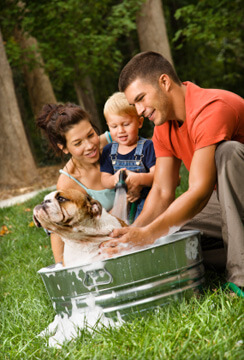 You should not bathe your dog more often than every two-to-three weeks. If your dog’s coat could do with some freshening in between baths, use Bath Fresh Mist to neutralize odors and condition the skin and coat. This product is so simple to use … just spray and brush into in the coat. You will love the aroma and your dog will love the attention! And what about you? Do you have any “must-know” grooming tips that you’d like to share with your fellow blog readers? Be sure to leave your thoughts in the comments section below. Completely brushed at least every other day. We always have the bag of Tasty Rewards out when cleaning ears, clipping nails or giving our dogs a bath. They just watch the bag and wait patiently! As for the Bath Fresh Mist - what a great product for between bath times or when the dogs get caught in the rain - it takes away that "wet doggie smell" immediately. If you have a small dog, and the dog gets smelly often, if you keep its ears clean and learn how to clean out the scent glands (a vet. will show you how, it's quite easy but not a nice procedure), your pooch will be far less smelly. Don't forget to clean the ears, too! Glad I found your post. Very helpful indeed. I enjoy what you guys are up to. Such clever work and exposure! Keep up the great works guys. Greetings from California! I'm bored to tears at work so I decided to check out your blog on my iphone during lunch break. I love the knowledge you present here and can't wait to take a look when I get home. I'm amazed at how fast your blog loaded on my cell phone .. I'm not even using WIFI, just 3G .. Anyways, fantastic blog! Your way of describing everything in this article is genuinely nice, everyone can simply understand it. Thanks a lot!